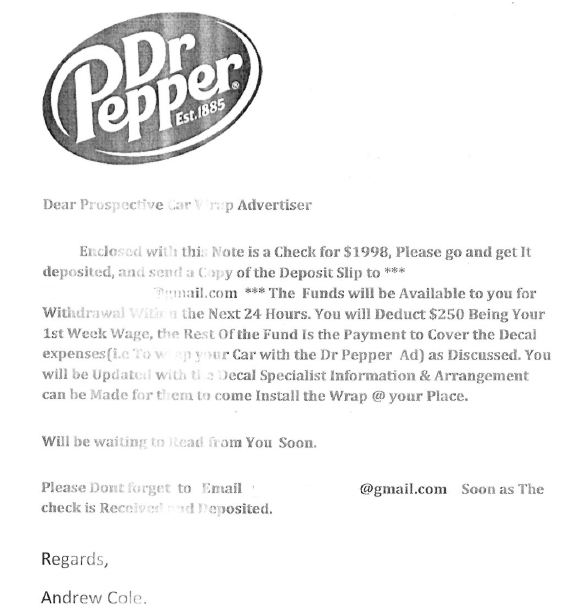 Resource One Credit Union has received reports of a check scam in which the recipients are told they are being provided an opportunity to become a Dr. Pepper car wrap advertiser. In this scam, people are being sent a check through the mail and are instructed to deposit the check to their account. They are then told to deduct their first week’s wage from the total and send the remaining amount as a money order or certified check to cover the wrap on their car. People who deposit the check into their financial institution end up having the check bounce and are held liable for the entire amount of the check plus any fees that occur. If you believe you have received a similar offer, please do not deposit the check. They tell you to wire money to them after you’ve deposited the check. They claim to be from another country. The checks are fake but look real. You don’t have to wait long to use the money, but that doesn’t mean the check is good. There is no legitimate reason for someone who is giving you money to ask you to provide funds back to them. You have never been contacted by this person before. The opportunity seems “too good to be true”. The letter contains typos and grammatical errors. The Federal Trade Commission also provides helpful information on how to spot these types of scams.